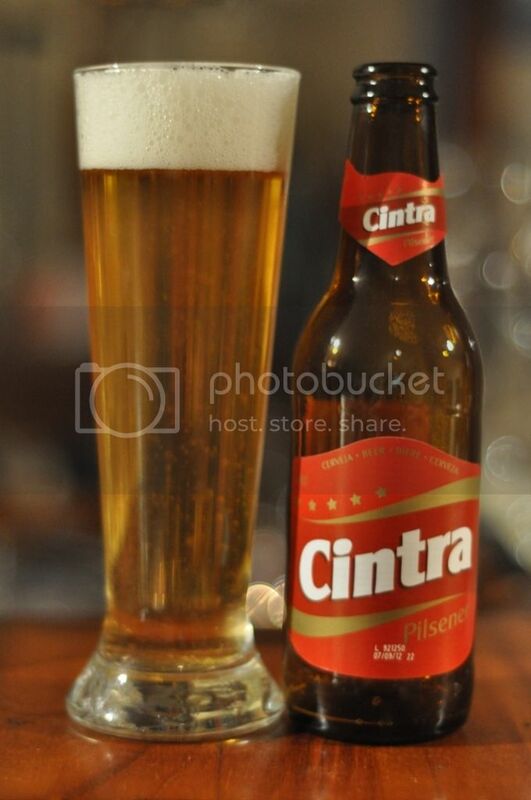 Cintra is one of a number of Portuguese lagers that are suddenly flooding the Australia drinking market. Just 3 or 4 months ago it was impossible to get any beers from Portugal, now this is the 4th different one to turn up in that time. So I recently received 2 cases of this beer to review for a PR company, trying to get some support for the beer. I told them I wouldn't pull any punches and if this beer isn't very good, that's exactly what I'll be saying. Straight off the bat though no glass was an error on their behalf, I like glasses. I also haven't seen Cintra in stores anywhere so I don't where to send you to buy it. Now that my little rant is over we can get onto the beer. The pour is a lovely deep golden colour with plenty of carbonation feeding a nice 2 finger white head. The head retention is excellent and there is a thick film over the entire beer for the entirety of drinking, there is also a fair bit of lacing which I like to see in any lager. Overall pretty impressive looking beer. The nose is fine for an American adjunct lager, however theres nothing hugely notable about it. The aroma is mostly made up of bready malts mixed with some lager yeast. Hops are present but don't seem to be particularly strong or bitter. As is often my comment about adjunct lagers if the beer doesn't smell bad then the nose is fine, and that is exactly what Cintra's nose is like. It's pleasant without being strong or exceptional. In terms of flavour Cintra is relatively light, even by lager standards. The most noticeable thing about this beer would be the mouthfeel, it's very light in the mouth but it has lively carbonation which feels great on the tongue. For the most part the beer tastes of bready malts with the grassy hops being almost an after thought and not adding a great deal of bitterness. Theres also a fair bit of citrus towards the end of the palate. Overall this is nothing more than an average lager. The flavours are no better than your average Euro beer brewed under license here in Australia. This would make a pretty good session beer, it's very easy to drink and served ice-cold it tastes better. If you find it in slab form and it's cheap, it's probably worth a shot. If you want to try before you buy, I've still got a heap here and you're welcome to come and have a beer.